In order to discuss how South Africans tweet, it is important to contextualize and ground the platform in the country and social networking sphere. According to the latest South African census data (2011), the country has a population of almost 52 million people. South Africa’s Digital Media and Marketing Association (DMMA) measured the country’s Internet population at 14 million people. This represents 39% of adults in South Africa (Nevill, 2013). World Wide Worx and Fuseware published a report in 2012 stating that social networking in South Africa has crossed the age barrier and the urban/rural divide. By the end of August 2012, 5.33-million South Africans were using Facebook on the Web, 2,43-million were using Twitter, and 9,35-million were using the mobile messaging platform MXit. A new report on social media in South Africa will be released in early September 2013, but Arthur Goldstuck from World Wide Worx has confirmed that their latest research indicates that the number of Twitter users in South Africa has doubled in the last year and is now standing at around 5 million (2013). 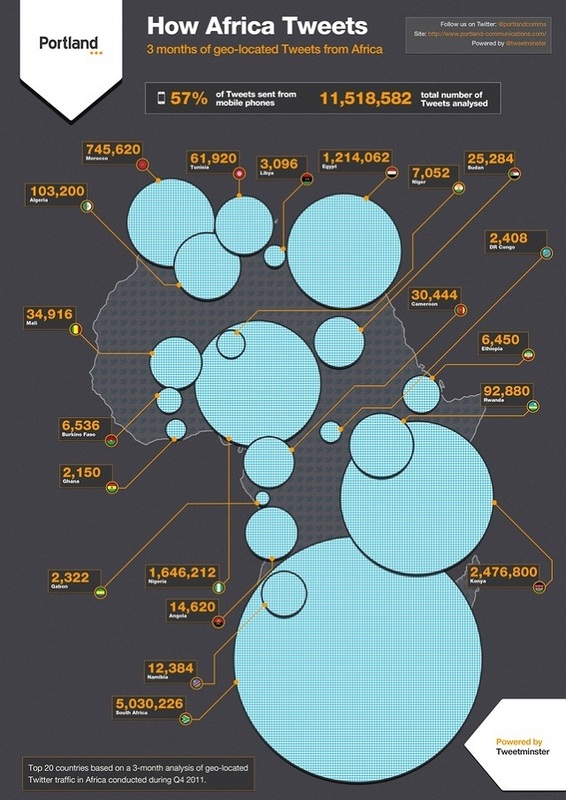 In the beginning of 2012 Portland Communications released a report entitled How Africa Tweets in which South Africa was named as the biggest tweeting country in Africa. According to Goldstuck this is largely due to the fact that South Africa is the country with the best Internet infrastructure on the continent. Twitter has played a key role in people’s revolutions in Egypt and Tunisia, and according to Portland Communications young people have embraced the immediacy and freedom of Twitter to escape the constraints of censorship. It has also been adopted by young people across the continent for their more varied daily needs. According to MyBroadband in January 2013 the most popular Twitter users in South Africa were comedian Trevor Noah (958,089), followed by 5FM DJ and Idols judge Gareth Cliff (512,030) and TV presenter and entertainer Bonang Matheba (472,391). Cliff’s influence was clear earlier this year when he sold out a screening of the movie Wolverine in less than 3 minutes on Twitter (Memeburn, 2013).